Jan. 6, 2014, 11:33 a.m. The team that runs the Times’ Twitter accounts looked back on what they learned — what worked, what didn’t — from running @nytimes in 2013. By Michael Roston @michaelroston Jan. 6, 2014, 11:33 a.m.
With contributions from Hanna Ingber, Sona Patel, Daniel Victor, Lexi Mainland, and Sasha Koren. The social media desk at The New York Times expanded in 2013 with the addition of three editors and a broadening of our roles in the newsroom. Beyond editing Times social media accounts, our team devotes an increasing amount of labor to working with the paper’s editors and reporters to integrate reader engagement into our most important journalism. But with nearly 5 million more people following @nytimes in 2013, more and more consumers of The Times are finding their way to our journalism using our main presence on Twitter. For that reason, we took stock of what worked and what didn’t on @nytimes. We examined some of 2013’s most successful tweets, measured in terms of clickthroughs and retweets, to see what connects with these readers and where our investment of editorial effort really paid off (the data comes from SocialFlow, whose system the Times uses to manage some of its major Twitter accounts). We also looked at some of our strategies and tactics to encourage a variety of types of reader engagement with our journalism using Twitter. 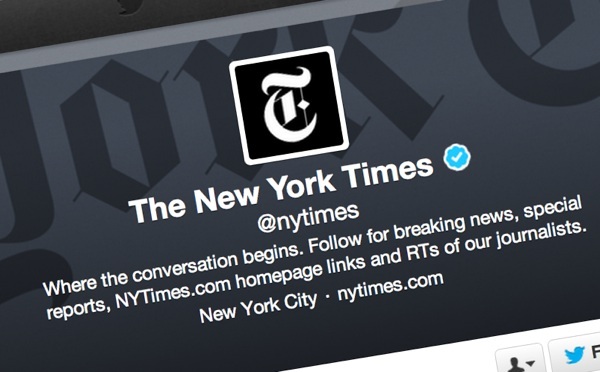 Here are some lessons we learned in 2013 from what we did on @nytimes and other institutional Twitter accounts. Readers come to @nytimes for many reasons. But in major breaking news situations, it becomes abundantly clear that large numbers of readers are glued to our Twitter feed and waiting for the next update. And while Twitter’s misuse in breaking news situations was well lamented in 2013, it is what readers are coming to us for more than anything else. The more prepared we have been with clear protocols for how our Twitter efforts fit into The Times’s overall coverage of a developing story, the better we’ve performed. The Times takes a thoroughgoing and cautious approach to using Twitter when major news occurs. The social media desk operates in concert with, not independent of, our main newsdesk, which is comprised of homepage, front-page, and masthead editors. The updates we tweet are pegged to news reports that editors have approved and never seek to get out ahead of our news report. We focus on retweeting reporters and editors who are directly involved in covering the news, steering clear of external sources of information whose accuracy we cannot count on. The @nytimes feed became a primary vehicle for delivery of the latest moment-to-moment updates from The New York Times during the week of the Boston Marathon bombing. We stuck to the protocols described above during our extensive coverage of the attack and its aftermath. Those procedures helped our desk avoid any major errors over those days. During one of the biggest news weeks of the year, readers stayed with our Twitter account. Of the 10 most clicked links delivered via @nytimes in 2013, five pointed to Times coverage of the Boston bombing. The Times’s coverage of other major breaking news stories was also well represented in the most clicked and retweeted stories of 2013: the terrorist attack on the Westgate mall in Nairobi; the papal transition; the crash-landing of Asiana Flight 214 in San Francisco; the conflict in Syria; the Supreme Court’s rulings on gay marriage; George Zimmerman’s encounters with the criminal justice system; the memorializing of Nelson Mandela; and more. The strong response to these tweets signals the need to continue to prioritize readiness to cover major news developments thoroughly and accurately. Hiroshi Yamauchi, former Nintendo president who transformed a small playing cards company into a global video game giant, has died at 85. Letting our trusted reporters deliver some news first helps them connect directly with an interested audience, and delivers news in a timely manner without sacrificing our commitment to accuracy. Beyond clicks and retweets, our institutional Twitter accounts, of which we have several beyond @nytimes, were effective tools to advance storytelling by the Times’s journalists. Some methods, like sending callouts for sources on major stories used a variety of methods, including social media. Others relied solely on Twitter. One effective method was organizing highly structured Twitter Q&A sessions with reporters using institutional accounts as a moderator. At times when there was a heightened reader interest in a complex, developing news story, New York Times Twitter accounts curated discussions with Times reporters. The effectiveness of this approach was visible during the political crisis in Egypt, when The Times’ David D. Kirkpatrick answered reader questions that were selected and filtered by an editor who was managing the @nytimesworld account. The use of Twitter in this fashion proved highly accessible to a burgeoning Times audience. It also was easier to follow than Q&As between individual reporters and readers using Twitter to speak directly to them without an intervening agent. Andy Murray is Scottish, not English. Had a social media editor been minding the feed at the time this tweet was published, it is likely she or he would have jumped in to correct the error, which was resolved more quickly on the website. On a Twitter account that was automated at the time, the error snowballed around social media and the web for hours. When our hands are minding the feed, errors like that either don’t happen or have less of an impact. Twitter is a platform that helps extend The Times’s journalism to an audience that is not always the same as the one that visits our website directly. When we fit our storytelling to the medium, we do the best possible job of connecting with that audience. Ultimately, we don’t always need to try so hard to write an unforgettable tweet, or one that tempts the reader too much. Clarity and straightforwardness around interesting subject matter are ultimately rewarded by substantial reader interest. Many New York Times articles, videos, slideshows, graphics, and blog posts don’t need to be read only at the very moment they were published. There is an enduring interest in coming back to them at moments that are more convenient for the reader. That’s why we see some articles floating on The Times’s Most E-Mailed list for a week or more. The same is true of Twitter. During 2013, we began consistently scheduling multiple runs of tweets highlighting some of our best enterprise material, especially during weekend hours and overnight, when @nytimes is mostly automated. It goes without saying that if you tweet more, you’ll get more traffic overall. But what we found when we scheduled tweets on Saturday and Sunday was that the average click per tweet grew substantially. What that meant to us was that a story that was of great interest to readers on a Tuesday afternoon is likely to be of interest to readers grazing Twitter on a Saturday night who didn’t see it the first time around. It also encouraged us to think about how our Twitter accounts can better serve The Times’s global audience. A balance has to be struck in terms of what you recycle, and how often. For instance, a breaking news story that was of great interest Monday afternoon will likely be passé on the following Sunday night. But, when used thoughtfully, we found that recycling enterprise material served our broader audience by delivering our most interesting journalism to them at times when they were available and ready to read it. We tweeted some stories without any expectation that they would be popular on social media. But suddenly a story buried deep in the paper, targeted toward a niche audience, was widely and heavily shared across social media. We couldn’t always pinpoint the origin of the great interest in an article, but we liked finding the nowhere from out of which a wave of social media attention came. For instance, why was this tweet of an article from The Times’s real estate section one of the most clicked in 2013? You can’t plan for that kind of a lift. Sometimes we were greatly surprised by the audiences that connected with our journalism via social media. May we be ever surprised in the year ahead. Michael Roston is a staff editor for social media at The New York Times. POSTED Jan. 6, 2014, 11:33 a.m.
Roston, Michael. "If a tweet worked once, send it again — and other lessons from The New York Times’ social media desk." Nieman Journalism Lab. Nieman Foundation for Journalism at Harvard, 6 Jan. 2014. Web. 18 Apr. 2019. Roston, Michael. "If a tweet worked once, send it again — and other lessons from The New York Times’ social media desk." Nieman Journalism Lab. Last modified January 6, 2014. Accessed April 18, 2019. https://www.niemanlab.org/2014/01/if-a-tweet-worked-once-send-it-again-and-other-lessons-from-the-new-york-times-social-media-desk/.